With its wide-open spaces, hardworking people, excellent public school systems, and abundant resources, Wyoming is a wonderful place to raise children. That is especially so in Park County School District No. 6 and the communities of Cody, Valley, and Wapiti. Our district is fortunate to have talented and dedicated students whose parents and grandparents value education and are involved in the process. Parent attendance at school events is extremely high, especially when students are performing, but also at parent-teacher conferences, parent meetings, fundraisers, and other school functions. From the Board of Trustees to classroom teachers, Park 6 is fortunate to have an abundance of skilled and dedicated people working for the district. Cody is among the premier school districts in Wyoming. 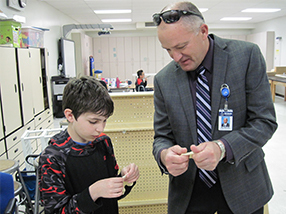 The number of National Board certified teachers Park 6 employs along with the number of teachers who hold master’s degrees is impressive for a school district of 2,000 students. This speaks highly of the community and local expectations when it comes to educating our community’s youth. It certainly indicates a commitment to and respect for the education profession. Several years ago the Board of Trustees worked with community stakeholders to forge a new vision for Park County 6 Schools. Armed with our district beliefs and mission, this vision guides us in reaching our goals. As we work together, I will strive for transparency and effective communication with you, our learning community and stakeholders, whose input I will solicit regularly and value immensely. Thank you for this opportunity to educate your children, and thank you for your support of the Park 6 staff.